A microbrewer or a brewpub license-holder. The chair of the council will be the director of MDARD. 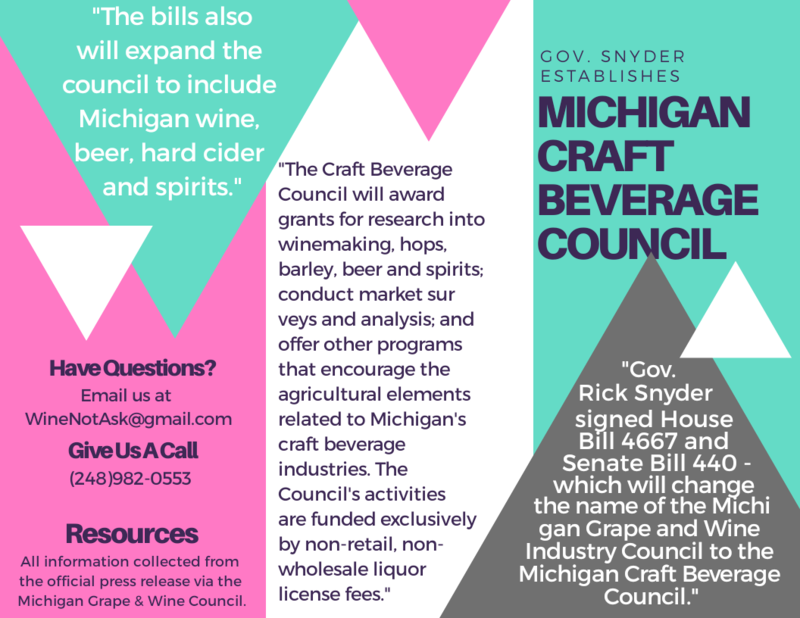 The first meeting of the Craft Beverage Council was held in Lansing with leaders of the wine, beer and spirits industries along with representatives of beer and wine retailers and restaurants. The meeting’s purpose was to introduce everyone to the new legislation, share details of how the CBC will work and answer questions. Each industry rep was instructed by the director of MDARD to suggest people from their industry who might serve three year terms on the CBC Board. Anyone interested is to apply through the MI.gov website before the end of July. Then selections will be made and the first Board meeting will be held in early October to begin operations of the CBC. The first years of the CBC will set the course for how the new organization will function so it is very important that industry representatives have thorough knowledge of their industry. Those reps will be responsible for insuring the needs of their constituents are presented and addressed by the CBC. Contact Us with any questions.